This comes from a 2003 trip down the Oregon Coast. It's somewhere around the area between Waldport and Florence. I really like the rock formation jutting out into the ocean with the strong violet rocks against the blue water, the emerald green things, the yellow green, and the reddish and white things in the foreground and right. "x 10" matted print on photo pape. Pointillistic/Impressionist Giclee prints of Oregon on real canvas or heavy watercolor paper are available. One of a kind Oregonian embellished prints, which are Giclee prints retouched in genuine oil paint by PaulB. Unless noted PaulB's original Pointillistic/Impressionist oil paintiings are oil on canvas. 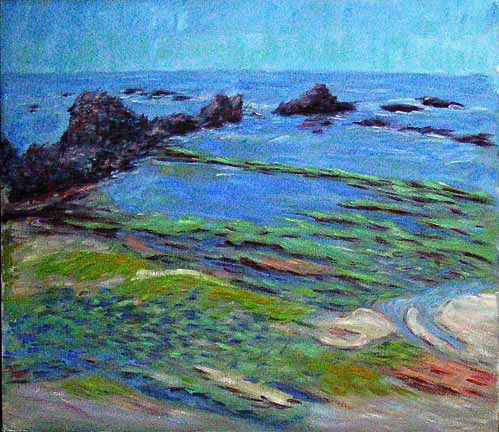 Paul Berenson's pointillistic/Impressionist oil paintings are in privale collections around the world, including the downtown Los Angeles Athletic Club and have appeared in numerous publications, including the New York Philharmonic Playbill. PaulB.com also builds websites and PaulB is a member of the LA Web Professionals Group.